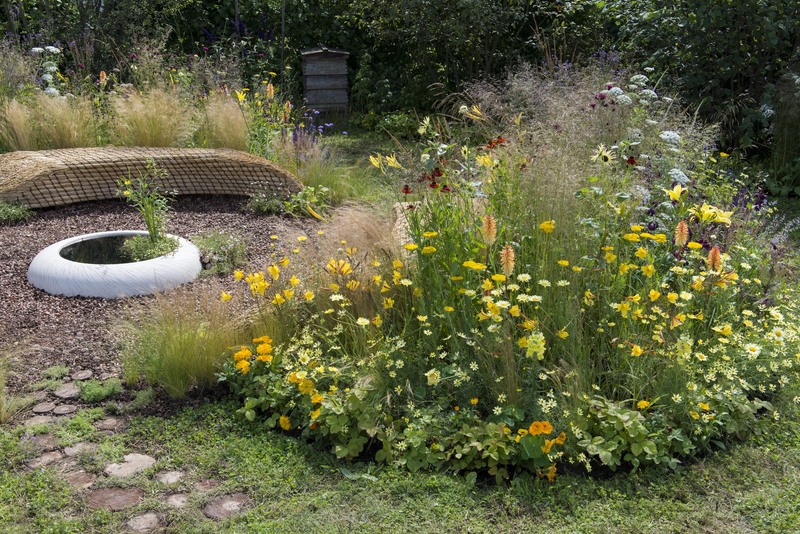 The Widex Hearing Garden was the first RHS Show Garden created at the Hampton Court Palace Flower Show with the design focus on the sounds found in gardens. It was sponsored by Danish hearing aid manufacturer Widex and supported by the Association of Independent Hearing Healthcare Professionals (AIHHP). The show garden was Selina’s first RHS Show garden and it included some innovative features such as an interactive 'Listening Wall' - where visitors could listen to garden sounds and a percussion screen where visitors were able to make their own music. Using sustainable silver birch harvested from local common land for the screens and chimes, the RHS Show Garden also included a limestone water feature with sculpted spout falling into a plunge pool. The garden's planting and design represents a typical sub-urban courtyard garden, creating a sensory wonderland that alluded to the world of hearing. Silvery willow and juvenile Eucalyptus provide a gentle background sound. Meanwhile, the jagged swords and spikes of Astelia and Fasciculia represented the frustration that can be associated with hearing loss. In contrast, soft herbaceous planting flowed like a whisper around the water feature. Their mauves, greens and silvers created a sense of calm, enlivened by bright yellows and oranges. Selina was inspired by the fact that people do not always appreciate the sounds around them. "Being in a garden, immersed in a full sensory experience is one of the great pleasures of life," she added. “This show garden is designed to help people to appreciate and celebrate those every day sounds that are so important in our enjoyment of the world around us."